Since this has been the prevailing attitude, Sullivan had to undertake a great deal of research. He dug up what he could but was forced to make up some characters and events in order to tell the story of long-forgotten World War Two hero Pino Lella. Lella rescued many Jews, political prisoners, and Allied fighters in his late teenage years. He guided many to escape through the Alps to Switzerland and then he became a spy while serving as the driver for high-ranking Nazi General Hans Leyers. Pino demonstrates bravery and praiseworthy character for all his work. However, I found it a bit of a stretch that an eighteen-year-old, is an expert survivalist, translator (When did he learn English? ), driver, and car mechanic. The author portrays him as a mixture of James Bond and saint. Also, at this age, he embarks on a relationship with a 24-year-old woman named Anna. At their ages, maturity levels are so different that it seems implausible, but then again, in times of war, anything can happen. I questioned Pino’s attraction to her because she initially treated him with disregard and yet he still dreamed of reconnecting with her. 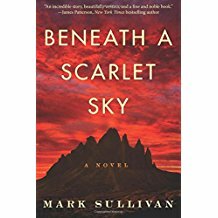 Sullivan successfully captures the beauty of Italy’s landscape and architecture that becomes penetrated by darkness and misery when the Nazis ravage the land and its people. Readers get a glimpse of dictator Benito Mussolini when he makes a few appearances, and the author recounts the internal conflict of the Resistance vs. the Fascists among the Italians. There is much to learn in Beneath A Scarlet Sky while it also serves as a reminder of war’s brutality and destruction. Despite a few flaws, it is a worthwhile read.